Emperor Leopold I had planned to build a palace that would rival, or surpass, Versailles. 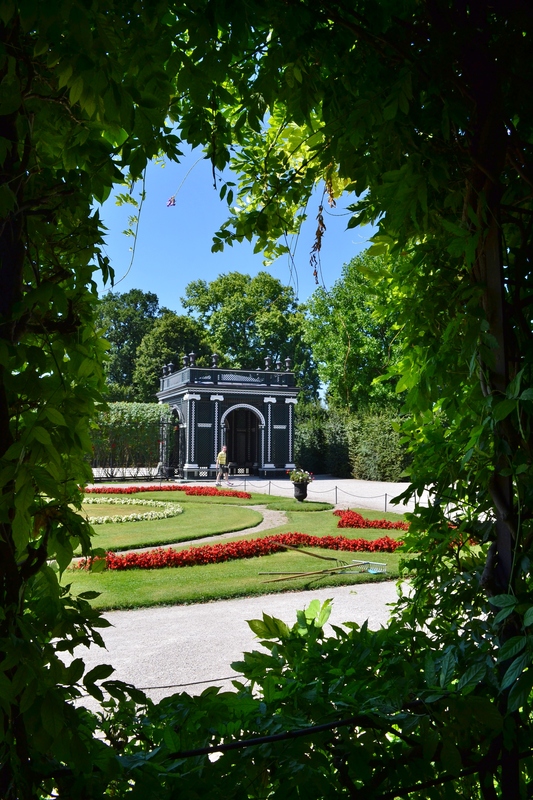 At the end of the day, Schonbrunn did not meet that goal, but its elegant lines and interiors still impress. The Palace has over 1400 rooms, but only 30-40 are opened for touring. 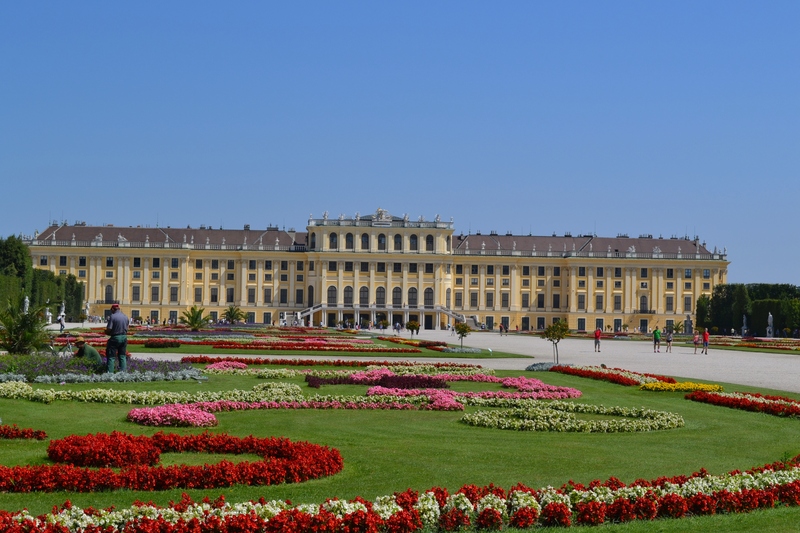 Schonbrunn is a very popular tourist destination, so if you go in the summer, you might consider purchasing tickets online ahead of time to avoid lines. 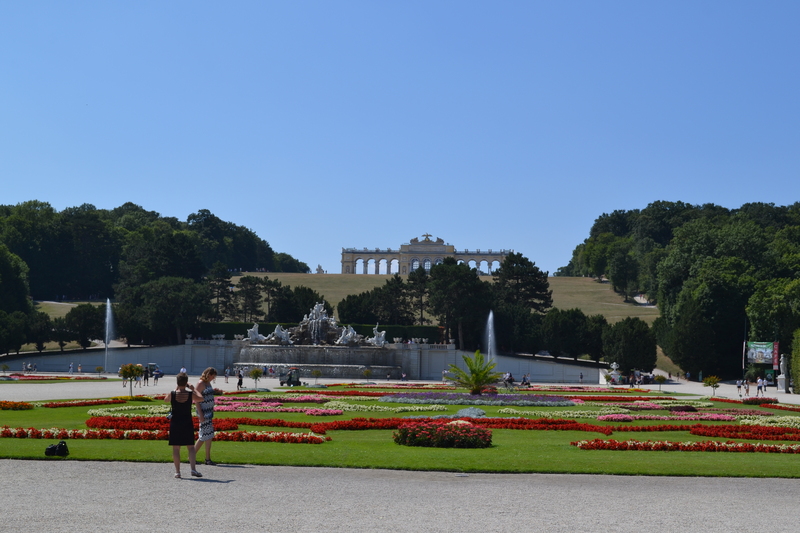 Schonbrunn also hosts many concert series and has a zoo on its grounds, so there is lots to do. Plan on spending at least half a day there (better still, a whole day). 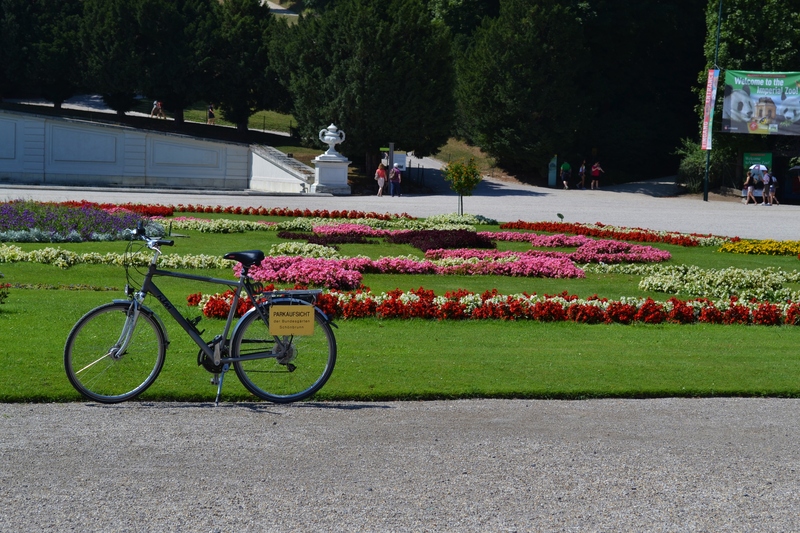 Finally, I’ll leave you with one of my favorite photos from the day: a bicycle in the gardens. Not sure why I love this photo so– maybe it brings a human scale to a massive palace and grounds, or simply offers a sense of adventure and movement (travel!) to a formal landscape. Great photos! I can’t imagine touring places when it’s that hot without air conditioning. 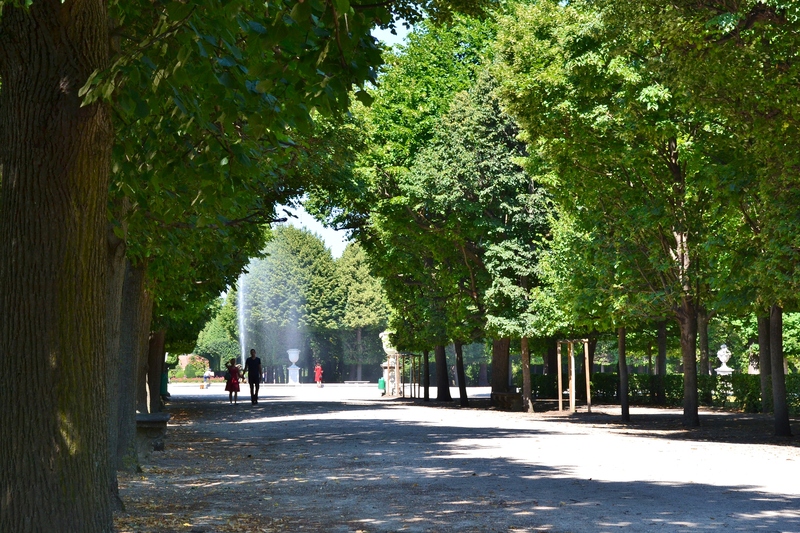 It was a good idea to focus on the gardens instead – they are beautiful. I also really like the photo with the bike. Sometimes something a little unexpected just makes a photo more interesting! Thanks! It was a lovely palace and gardens. The heat was unfortunate–the palace interior was really extraordinary, but became quickly unbearable. You’re right about the unexpected details in a photo– adds some punch to the scene! Thanks for dropping by! I didn’t know about this palace. I’ll add it to the list of ‘to visit’ places! I went in Winter – how different from these photos. I’m sure that was beautiful! I’d love to stroll through the interior of the palace on a cool day. Maybe next visit! Thank you. Lovely environs, for sure. 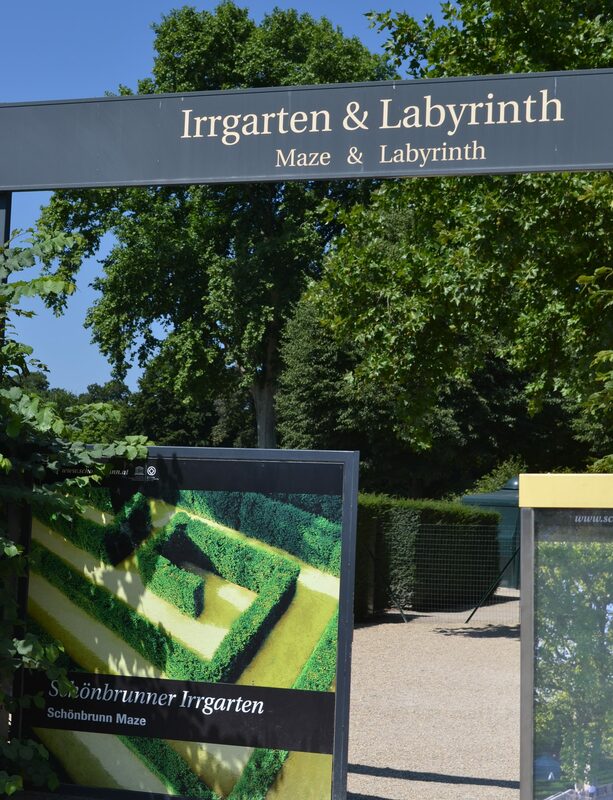 I was travelling with family–adults and teenagers– so the mix of high culture (interior rooms) and fun (racing through the maze) kept everyone happy. We went to the zoo too and that was lovely! Oh, I bet that was fantastic! Is the market out in the “back” gardens? Is it a huge affair? I’d love to see that! it’s very big and it’s at the garden at the main entrance:) it’s great!